Grid orders your filter menu by category ID, which means that your categories will display in the order in which they were created. We chose to build the plugin this way so that it would be possible for you to reorder your filter menu. To do so, you will need to recreate your categories in the correct order and map the old categories to the new ones. Here’s how to do it. 1. Install the Term Management Tools plugin. If you’re searching under Plugins > Add New, you will need to scroll down a bit to find the correct plugin. It hasn’t been updated in a few years, but it still works. You may deactivate and delete this plugin once the process is complete (or use it to reorganize your other categories and tags!). 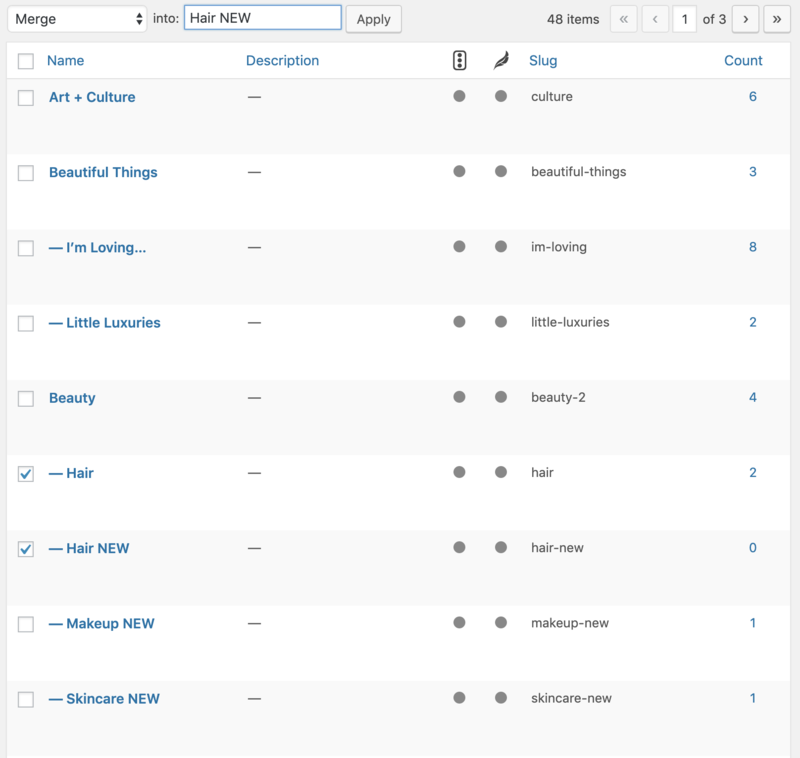 Head over to Posts > Categories and recreate all of your sub-categories in the order you want them to appear. Don’t forget to select the proper Parent Category. Type NEW after each to distinguish from the old — we’ll update this later so it doesn’t display on your site or change the URL to the category. Reload the page after you have added all of the new categories, so that you are able to work with them in the next step. 3. Merge each old category with the new in order. Next you’ll need to merge each old category with its new one. Check both the old and new category, then select Merge from the Bulk Actions dropdown menu, and match the new category name. This ensures that the merged category retains the new category ID so that your categories will appear in the order you want. Repeat for all categories. 4. Update your category names back to the original name. Now you can update all of your categories to remove the “NEW.” Hover over each and click the Quick Edit link. Delete NEW from the Name, and don’t forget to delete “-new” from the slug as well to keep your URL structure the same as it was.